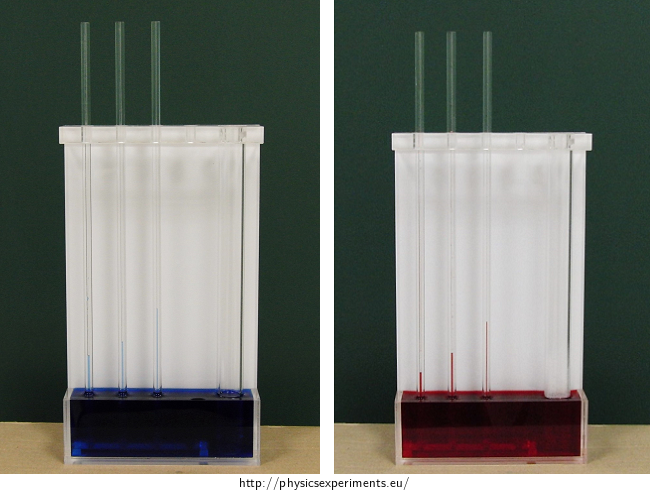 The goal of this experiment is to show the dependence of height of the water level in the capillary vs. the capillary diameter and water temperature. If a capillary (a tube with very small internal radius) is immersed into a liquid, the liquid level in the capillary is above (or below) the liquid level outside the capillary. When a liquid wets the container walls, it causes capillary elevation – liquid level in the capillary is higher than the liquid level outside the capillary. Non-wetting liquids cause capillary depression – the liquid level drops below the level outside the capillary. where σ značí povrchové napsignifies the surface tension of the liquid at given temperature, r is the capillary radius, ρ is the liquid density and g is the gravitational acceleration. Note: Derivation of this relationship can be found in the task Capillary action between glass plates. From the relation (1) we can see that with increasing radius of the capillary, the height of the liquid level in the capillary decreases. Note: To solve a similar problem, see Height of Water in a Capillary Tube. Dye cold water with food colouring. Immerse a capillary into the water. See how the high of the water level in the capillary rises. You can mark the height of the water level in the individual capillaries with a marker or an adhesive paper. For our experiment, we used cold water at a temperature of approximately 10 °C, which we dyed with a blue food colouring, and hot water at about 70 °C dyed red. Figure 2 shows capillary elevation in the case of cold water (left) and hot water (right). Figure 3 shows a detail of the capillaries with cold and hot water. To compare the height of the levels we lead lines from capillaries in cold water to the capillaries with hot water. You can see that cold water rises higher than hot water. 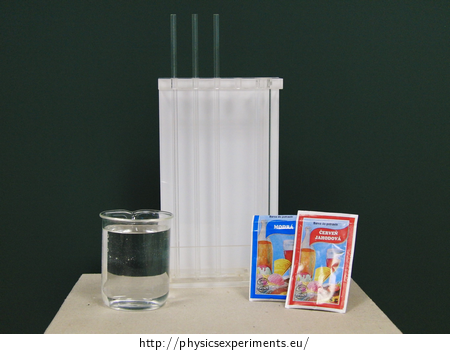 The height reached by the water level in the capillary can be measured and compared with the calculated height according to relationship (1). You can discuss with the students whether the measured value corresponds to the theoretically calculated height of the capillary elevation, or why these values differ. Thermal Conductivity of Plastic and Metal I. Thermal Conductivity of Plastic and Metal II.